The Spirit® II FineLine® High Definition plasma cutter has redefined the cut quality normally associated with CNC controlled plasma. This results in virtually dross free cuts that require little to no secondary processing. The Spirit II also uses up to 78% less plasma gas than the competition, and has unparalleled consumable life through our patented Hafnium Optimizing Technology™ (HfOT) copper electrodes. It not only offers a new industry standard for operating costs, but produces a bevel edge of less than 2° over more than 1,000 pierces—something never achieved in a production machine of this caliber. Lincoln Electric’s engineering standard doesn’t stop there. It continues with the design and assembly of the Torchmate X. The strict construction of the gantry and the table’s precise linear guidance and drive system has made a very notable impact on the reputation of our CNC cutting tables. The combination of these systems makes this Lincoln Electric machine one of the most reliable, supported, and warrantied offerings in the industry. 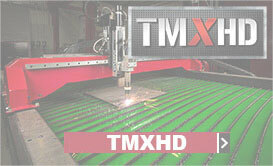 Every Torchmate XHD plasma cutting table is fully configured and assembled, needing only gas, water, and power to get your facility in operation. The available on-site training and installation will ensure that the machine is set up for your facility’s unique flow of materials. Our trained technicians will also be available to teach multiple operators how to run the machine. After the installation, our customers can rely on our esteemed technical support staff to troubleshoot and help maintain the machine for life. The Torchmate XHD plasma table is available in a variety of larger tables size. Table sizes of 6x14, 6x22, 8x14, and 8x22 are available. Burny CNC Shape Cutting Controllers features Burny® 8 Software which runs on a Windows® 8 Embedded Operating System (OS). The Burny 8 Software enables increased security, improved system performance and robust communication between a Burny CNC controller and a Spirit® II Plasma System. The operator interface is efficient, intuitive and user-friendly, which streamlines the operator's control of the cutting process. We will design a machine for your specific requirements when you call our sales team at 775-673-2200 Monday- Friday, 7:00am-4:00pm pacific time.